Are You Ever Worried About Your Books? This may sound a little hyperbolic, but for the first time ever I’m worried about where the world is heading. I was in grade school during the Cuban Missile Crisis. I vividly remember my mother creating a route for us to walk home from school — “if anything should happen.” She had food stacked in the cold cellar under the farmhouse where we lived. “If anything happens”, Mom said to hide under the house in the cold cellar and wait. I remember the Vietnam War protests, the 1968 Democratic National Convention and the various domestic bombings by “the hippies’. And later, I remember the invasion of Iraq and the Gulf War. They were all scary times but none of them seemed to threaten our integrity like the current days seem to be doing. If you’re reading books these days — the physical objects — take a few minutes to examine them. Today, most authors take a good deal of time to package their prose. They’re often involved in the cover design, page layout, colors, choice of font, graphics, and paper choice. Elements irrelevant to the process of reading, but elements that can impact how we as readers take in the material. In many respects, it’s a wonderful time to be an author. So many great options. And, in an era when so much media is altered, the book as physical object matters more than ever. Books stand as they are after they’re printed. They can’t be altered. They stand alone. Books are a conversation any reader is invited to have with the author. The words stand for themselves. There is no danger of photoshopping after the fact. But they are also fragile entities. They can be burned. At the risk of over-statement, it feels like a scary time for those of us who love books. Particularly with a leader who has proudly declared in both friendly and unfriendly press that he does not read books. Moreover, it is increasingly clear that what is not of personal value to him, he does not hesitate to encourage others to disparage or even destroy. I am concerned that if we are not mindful, we are in danger of losing our books. If we lose our books we will lose more than a written text. 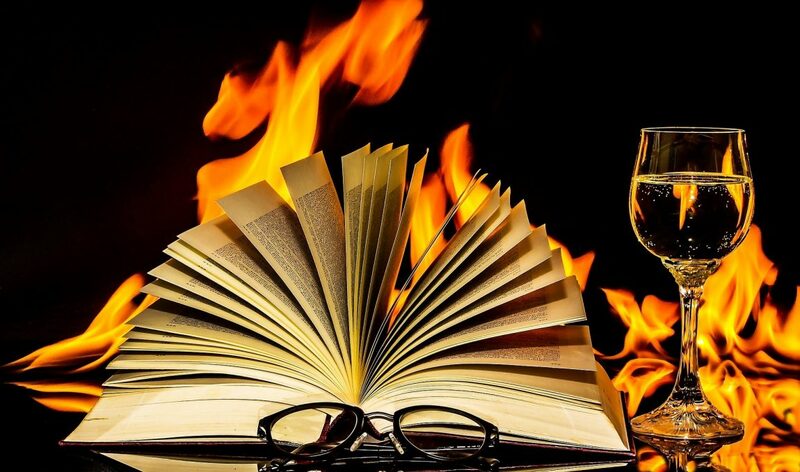 Ray Bradbury envisioned a world of burned books in his classic, Fahrenheit 451. If you haven’t read it, you should begin. Ideas — written ideas — are special. They are the way we transmit our stories and our thoughts from one generation to the next. If we lose them, we lose our shared history. We lose much of what makes us human. And fiction gives us empathy; it puts us inside the minds of other people, gives us the gift of seeing the world through their eyes. Fiction is a lie that tells us true things, over and over…. And then, when you are done with Ray Bradbury’s Fahrenheit 451 go pick up Alberto Manguel’s A History of Reading. — Oh my, it’s a lovely book. Manguel’s book is a heartfelt homage to the act of reading and the thing itself. 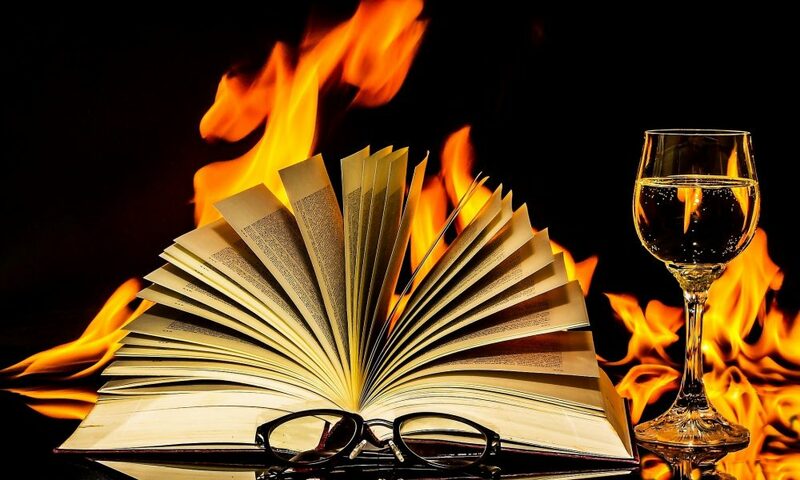 It tells us how books came to be and how they can be destroyed. But it’s more — it is a history of humanity and our many peccadilloes. Books help us answer those questions and explore different answers as we grow. Without books, all kinds of books, we will lose our ability to explore. If we are not careful and we don’t continue to honor who we are as individuals and diverse communities on this planet through the unique medium of the book, the concerns and fears quietly expressed by these authors, may come to pass. If we do not marvel and cherish the power of books not just for the ideas they spread and the knowledge they contain — but cherish them as objects that unalterably present the record of the author — a record that cannot be painted over, video edited, deleted or photoshopped — if we do not honor and cherish our books, we are in danger of losing our history, our integrity and our humanity. If you love books, let’s all go out and buy a book today! To explore more of the power found in books, sign up below for some free tools and our regular newsletter ~ Footnotes For You.